Battery - Hero MotoCorp Ltd. The battery is located behind the right side cover. Check the battery electrolyte. The electrolyte level must be maintained between the upper and lower level marks on the battery. 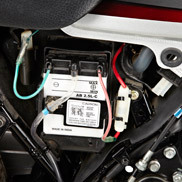 If the electrolyte level is low, disconnect the cable from battery negative and positive terminals, remove the bolt and remove the bracket for access to the battery. Remove the battery filler caps. Carefully add distilled water to the upper level mark using a small plastic funnel. Use only distilled water in the battery. Tap water may shorten the service life of the battery. Dispose off used/ old battery to authorized dealer only. Insufficient electrolyte results in sulphation & plate damage. It is not necessary to check the battery electrolyte level or add distilled water as the battery is a Maintenance-Free (sealed) type. If battery seems weak and/or electrolyte is leaking (causing hard starting or other electrical troubles), contact your Authorised Hero MotoCorp workshop. This symbol on the battery means that this product must not be treated as household waste. 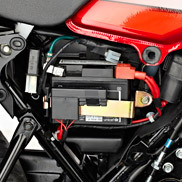 This symbol on the battery means the old battery must be returned to your Authorised Hero MotoCorp workshop as it must be treated as recyclable material. Battery is a Maintenance-Free (sealed) type and can be permanently damaged if the sealing strip is removed. An improperly disposed battery can be harmful to the environment and human health. Always confirm local regulations for battery disposal. A spark or flame can cause the battery to explode with enough force to seriously hurt you. Wear protective clothing and a face shield, or have skilled mechanic do the battery maintenance.